Since certain financial regulations were loosened by the U.S. Congress in 1982 (rule 10b-18, to be specific), company stock repurchases -- commonly known as buybacks -- have rapidly become a preferred means of returning cash to shareholders. With buybacks, companies use cash on hand to purchase their own stock in either the open market or via tender offer. This reduces the company's share count and effectively increases ongoing shareholders' percentage ownership of the company. To put it another way, your slice of the pie stays the same while the pie itself gets smaller. Sounds innocuous enough, right? Who doesn't like pie? From the company's perspective, there's really a lot to like about buybacks -- for one, they're more flexible than dividends (less commitment), they can be used to manage EPS (a figure Wall Street loves to focus on), adjust the firm's financial leverage, offset share dilution from employee stock options and grants, and provide a "signal" to the market that management thinks the stock is undervalued. 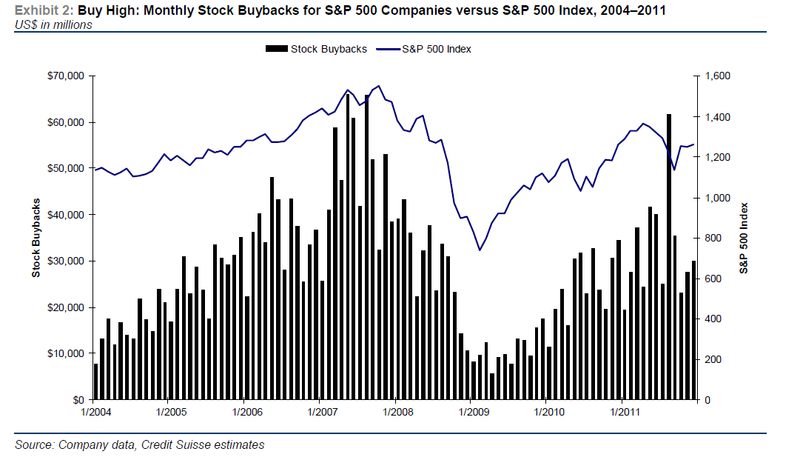 But from the individual investor's perspective, the benefits of buybacks aren't quite as clear. Stock buybacks, when used appropriately, can be a long-term shareholder's best friend if -- and only if -- the stock is undervalued when repurchased by the company and there are no better investment options. It's really that simple. When this is the case, there's a wealth transfer from former shareholders to ongoing shareholders. The problem is that executives don't have a great track record buying their own stock, at least when it comes to investing shareholder money (investing their own money is a different story) and frequently overpay. This excellent paper by Credit Suisse, for example, found that "It looks like most of the buybacks by the S&P 500 over the past eight years have not yet added much value for remaining shareholders." So why do companies consistently buyback their stock at elevated levels? I think there are two prevailing reasons. The second reason is that, in aggregate, there appears to be a lack of due diligence and proper valuation work being done in the executive suite. Even if we assume that all executive teams intend on repurchasing stock only when they consider it undervalued (and not for another reason), based on the studies we've seen, they're clearly not doing a good job of assessing their intrinsic value. Any company (or investor) can adjust its valuation model to show that the stock is undervalued. A little lower discount rate here, a touch higher growth assumption there (model garnishing, as it's called in the industry) and voila -- your stock is undervalued. Indeed, this recent article in the Harvard Business Review illustrates quite nicely the quixotic valuation assumptions used by companies when making investment decisions. It's unlikely that you'll find a corporate finance team that wants to report to the CFO that the stock is overvalued. At the risk of adding to the investing hagiography of Buffett (to which I've already contributed a great deal), I thought this passage from his latest annual letter to Berkshire Hathaway shareholders explained proper usage of buybacks quite well. Notice that Buffett specified a material discount -- for buybacks to create substantial value for ongoing shareholders, the stock must offer a superior return to what investors could get from a market index fund. Otherwise, hand back the cash and let investors earn a lower-risk market return on their own. Some buyback proponents argue that if you own the stock, you are doing so because you also believe the stock is undervalued and therefore you should be fine with the company buying it, too. Not necessarily. For one, long-term shareholders are generally not interested in selling a stock if it's slightly overvalued, particularly if they're receiving a good dividend from the stock or if they'll have a large tax bill if they sell the full position. In addition, even if the stock is just slightly undervalued, there may be better opportunities elsewhere and ongoing investors should prefer to have the cash back to reallocate to those opportunities. Others argue that if you want a dividend, simply sell a proportionate number of shares after the buyback. This might be fine for institutional investors with large positions, but for individual investors with smaller positions, this is less feasible due to transaction costs. It consistently rewards ongoing shareholders rather than giving the cash to former shareholders; therefore, it might attract investors focused on the next 3-5+ years and not the next 3-5 months, giving management a little breathing room to make longer-term investments. It lets investors decide if the stock is undervalued. If it is, they'll reinvest the proceeds themselves. It still provides room for smart buybacks when a clear case can be made for them. It solves the "What are we going to do with this extra cash?" problem. It forces management to become more thoughtful about acquisitions. While investors shouldn't expect a special dividend to be held steady year-over-year like a normal dividend, they'd also feel the loss if their special dividend was squandered on a dumb acquisition. Here's to hoping more companies consider special dividends as an alternative to buybacks, but I won't hold my breath. Buybacks, love them or hate them, are here to stay. Whether you're evaluating a new investment or an existing one, pay attention to management's track record of buybacks. If they've consistently bought back shares in bull markets and not in bear markets, it's fair to question the process behind their capital allocation decisions. The number of free stock screening tools has increased significantly in recent years. And while some screens are certainly better than others, investors often remain overwhelmed by the number of stocks these screens spit out, requiring yet further sorting for the best ideas. I've put together a ten point checklist that I use when considering new dividend ideas for my portfolio. There are always exceptions to these rules, but I've found that discarding ideas that don't match these criteria have more often than not saved me from making some big mistakes. To make a stock worthwhile for a dividend-focused portfolio, it needs to yield at least 2% otherwise it will likely take too long for the income generated by that stock to have an impact. Moreover, the lower the yield the more you're banking on high dividend growth rates to be maintained over the longer-term and that's not always a sure thing. A lot can happen to a company's fortunes in ten years that would reduce its ability to sustain an annual double-digit growth rate. Because the market has historically returned about 8-9% over the longer-term, any stock that's paying out approximately that rate each year in dividends is probably too good to be true. The market isn't likely to give away those types of opportunities without some major strings attached. If it were that easy, everyone would simply buy that stock to enjoy low-risk 8% annual returns, which would serve to drive the stock price up and the yield down anyway. In 2011, 22 S&P 500 companies initiated a dividend program. A handful of others have started programs in 2012, most notably Apple. While it's encouraging to see more companies paying dividends, individual investors should be skeptical of these stocks when considering them for inclusion in a dividend-focused portfolio. Most of them don't pay a high enough yield to begin with, but unless the company has established a firm dividend policy (30-35% of earnings, for example) it's unclear how the dividend will be managed over a full business cycle. Will the company hold the payout flat during temporary downturns or will they manage it based on anticipated longer-term growth? All else equal, I'd prefer to see how a company handled its payout across a number of scenarios and macro-environments before buying. Even companies with enviable track records of raising dividend payouts can run into trouble and the dividend put in jeopardy, as we saw quite clearly during the financial crisis. Watch out for companies whose dividend growth rates have slowed considerably in recent years -- a company that used to increase payouts at 10% per annum and now increases at 3% may be indicating trouble ahead. Indeed, 1-3% annual increases may be token increases aimed at maintaining a consecutive increase streak and may not be economically justified. Similarly, a company that used to steadily increase its payout but has held it flat year-over-year is usually an indication that the dividend is under pressure. Companies that consistently post returns on equity below 10% are probably poor places for your money. Given that the cost of equity for most firms is above 10%, firms that consistently generate ROE below 10% are more likely to destroy shareholder value. Equity owners are below creditors on the totem pole, so it's important to make sure that creditors are being taken care of before we can even think about dividends. In fact, creditors often attach covenants to their loans to ensure that the company will pay them back in full. If the company breaks those covenants (the details of which can be found in annual filings, if they exist), the creditors may have the right to restrict dividend payments to equity owners. Companies that cover each dollar of interest expense with more than $3 of operating profit (EBIT) are typically well ahead of their minimum covenant requirements. The higher the interest coverage the better. Interest coverage ratio standards can vary by sector -- utilities, for instance, can afford to have lower coverage ratios -- so it's wise to compare the company's interest coverage versus major peers. Another balance sheet metric to pay attention to, as it's often one used in covenants, is net debt-to-EBITDA (earnings before interest taxes and depreciation and amortization). Net debt is equal to total debt minus cash. Aim to buy companies with net debt-to-EBITDA ratios below 2x. While many companies have closed their defined benefit plans to new employees, there's a good chance that mature dividend paying companies are still on the hook for paying benefits to former and older current employees into retirement. If the company's pension is significantly underfunded, the company will likely need to shovel cash into the plan each year to keep it solvent and this is cash that may have otherwise been returned as dividends. Pension deficit figures can be found in annual filings. If the most recently reported pension deficit is more than twice the previous year's net income, the pension could remain a millstone around the company's neck for many years and weigh down its ability to pay dividends. We'll define FCF as cash generated from operations minus capital expenditures here -- both figures can be found in company filings on the cash flow statement. FCF is the cash left over after the company has made the investments necessary to maintain and grow the business, and it's with FCF that the company can pay dividends, buyback stock, reduce debt, etc. A firm that generates $80 million in free cash flow and pays out $100 million in dividends needs to make up that gap by borrowing or selling assets and both are unsustainable practices. To avoid such situations, aim to find firms that consistently generate at least $1.50 in free cash for each $1 they pay in dividends. This 1.5x level also provides a margin of safety in case the firm falls on a weak year or two. Firms issue new shares for three reasons -- to buy other companies, raise capital, or reward employees -- and none of them are particularly appetizing to common stockholders. Most large acquisitions destroy shareholder value, raising equity capital is typically the most expensive form of financing, and in the last case your stake in the company is being diluted as employees and executives cash in on options. Of the three reasons, I'm most likely to be fine with employees cashing in on the company's success (as long as the company is, in fact, successful), but I still don't want to see my stake diluted at more than a 2% annualized rate. If that's the case, the company is likely being too aggressive with option grants, running into financial trouble, or making too many (or too large) acquisitions. 10.) Avoid companies with a history of "funny stuff." Of the ten points, this is the most subjective and requires a little sleuthing. Does the company frequently take impairment or restructuring charges? That might be a sign that the company does not make good capital allocation decisions or could be covering up bad moves. At the very least, it makes the company very difficult to value and it's probably worth looking elsewhere. Once a stock idea has made it through the ten-point checklist, it's time to do put it on your watchlist and do some more research on competitive positioning and valuation. Also, read the latest proxies to get a feel for management's compensation and incentive metrics. These are all topics for future posts, but I hope that the ten point checklist helps you separate the wheat from the chaff on your screening results.